Regina Heinz returns to Decorex International this autumn to present her striking collection of hand-painted and glazed ceramic tiles and wall panels. 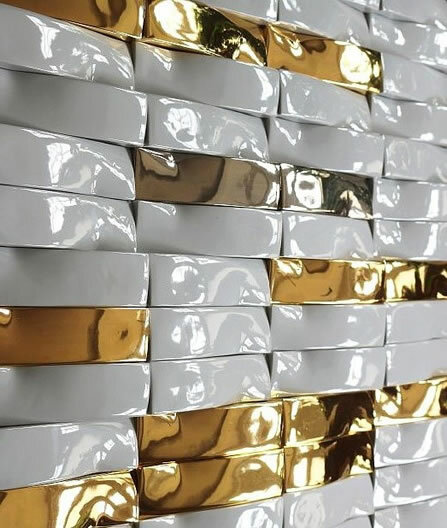 Poised between art and design, these beautifully crafted three-dimensional “tiles” create unique installations for public spaces and domestic settings alike. Since its inception in 2012 the collection has been continually expanded and now comprises hand-painted finishes, matte and high-gloss glazes, ceramic transfers, and luxurious gold and platinum surfaces. This year, Regina has created a new sculptural tile, “Flow3”, to be launched at Decorex 2016. The hard-wearing tile is cast in porcelain, suitable for interior and exterior applications. When combined, the narrow undulating shape forms intriguing weave-patterns and can be applied to curved surfaces. Also on show will be “Reflection”, a 2x2m ceramic feature wall comprising 108 modules. Highly reflective tiles, glazed in glossy shades of blue, alternate with matte white and luxurious metallic surfaces in gold and platinum, creating a stunning illusion of light reflected on water. Indeed, water has been a recurrent motif in Regina’s ceramic work, effortlessly translated into fluid forms and abstract flowing designs – some gestural, some geometric. 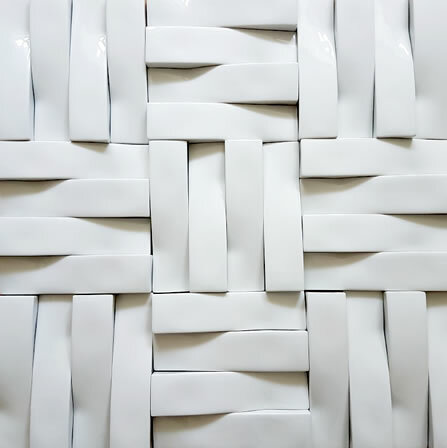 As an artist, Regina Heinz is known internationally for her tactile ceramic sculptures and reliefs, with their highly distinctive, abstract designs. Her unique brand of undulating tiles - created for the world of interior design - is a distillation of her work as an artist. The large-scale installations have the same undulating surface, the same combination of fluidity and rigour as her sculptures, designed to introduce beautiful colour, luxurious surfaces and stunning patterns of light and shadow into architectural spaces. It comes as no surprise that Regina originally studied fine art, in tandem with ceramics. This is evident in her sensitive palette of shades of colour, in the painterly quality of her designs and her intuitive sense of composition. Designs include minimalist and modern installations as well as luxurious creations in gold and platinum that lend themselves to both contemporary and more classical architecture. Her bespoke feature walls are increasingly sought after and used in hotels, private residences, restaurants and retail spaces.